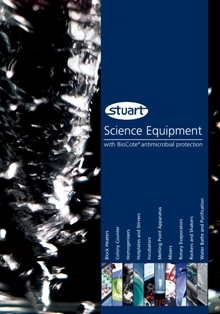 The latest edition of the Stuart catalogue has over 120 full colour pages of benchtop science equipment and complements the new Stuart website. Product highlights include Stuart's first-ever homogenisers for life science applications, innovative new manual and automatic melting point apparatus, and the SI500 shaking incubator. Important additions to the Stuart catalogue are the SMP30 melting point apparatus with patented `head-up display', and the automatic SMP40 which uses digital video imaging technology to detect and capture the melting point of up to three samples simultaneously. Other newcomers are the SHM1 and SHM2 homogenisers which offer fast sample processing for life science applications, with the option of disposable polycarbonate probes in addition to the usual stainless steel type. Also making its first appearance in the catalogue, the SI500 is a compact combined incubator shaker - ideal for cell culturing procedures, especially suspension culture applications. The Stuart range also includes block heaters, blood tube rotators, colony counters, hotplates, stirrers, rockers and shakers, rotary evaporators and water baths, and water stills. PDF pages of the new catalogue can be downloaded from the product pages on this site.